FileMaker, Inc., an Apple subsidiary, delivers innovative software to easily create custom business solutions for iPad, iPhone, Windows, Mac and the web. Millions of people, from individuals to some of the world’s largest organizations, use the FileMaker Platform to streamline their business processes, manage essential information, and boost overall productivity. 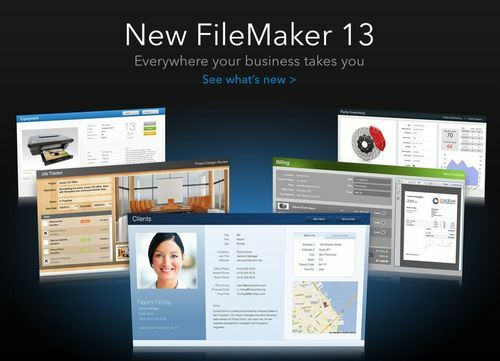 FileMaker, Inc. has unveiled the next-generation platform for business productivity: FileMaker 13. The new software makes it even faster and easier than ever for teams to create gorgeous, tailored business solutions for iPad, iPhone, Windows, Mac and the web that deliver significant productivity gains. FileMaker WebDirect, an entirely new, HTML5 browser-based technology that allows teams to create and deploy desktop-style solutions in a web browser with no programming skills required. Tools to create amazing iPad and iPhone solutions that support even more iOS behaviors, including slide controls, popovers and the ability to scan records using gestures. 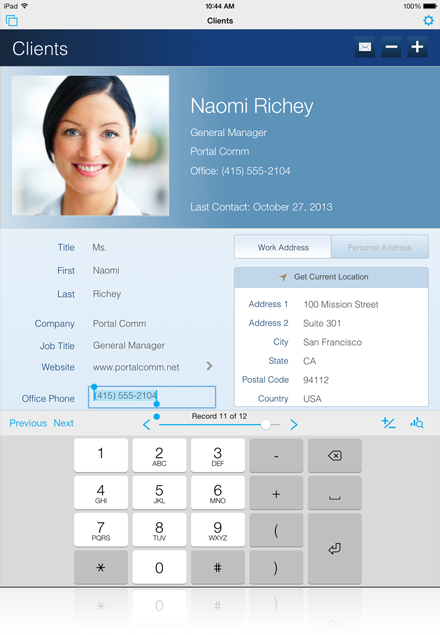 iPad and iPhone layouts can now be created in one step; and iOS solutions can include single-click capture of bar codes using on-device cameras and custom keyboards that speed data entry. Major improvements to design capabilities, including support for shareable custom themes and styles, and the ability to drag and drop data fields onto design layouts. More robust security, with AES 256-bit encryption that locks down data no matter where it lives – on iPad, iPhone, desktop or server. 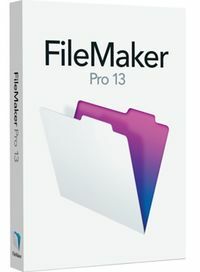 FileMaker Pro 13 Advanced is used to enable encryption. 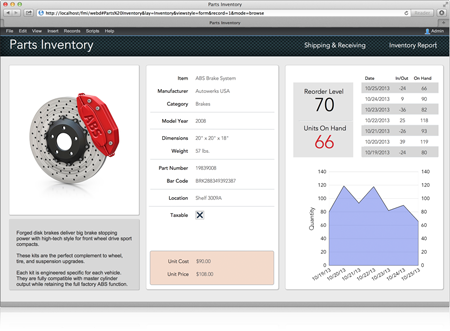 Dozens of new enhancements for solution developers, from the ability to hide or display objects on a screen based on business logic to easier integration with web applications. Simplified server administration, including an entirely new HTML5 administrative console in FileMaker Server 13 for managing business solutions from anywhere. Use themes, styles, charts, menus, and more. Even drag and drop files into container fields. Get instant access to changes in your data or solution – no need to refresh your browser. Enable scripts, calculations and conditional formatting to validate data and streamline workflow. Build solutions for iPad and iPhone even faster than before. 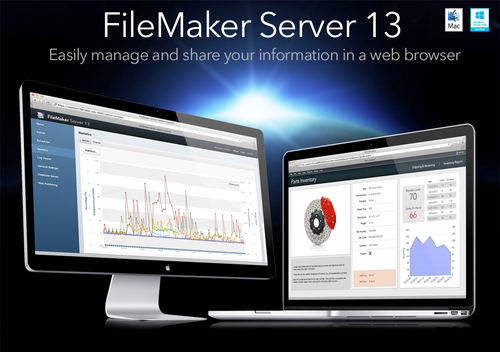 With additional support for native iOS behaviors, and new features to speed data capture; the FileMaker 13 Platform delivers the best experience for your team when they’re on the go. Create layouts and reports optimized for iPad and iPhone. Predefined screen dimensions, views, and themes make it easy to design for different iOS devices. Create iOS-style popovers on iPad, iPhone and desktop to group fields, links and other information without having to move to other layouts or windows. Create multi-panel slide controls to manage images and other data in separate slide panels all within same layout. Swipe to navigate between panels on FileMaker Go and click to move between panels in FileMaker Pro. Choose one of 7 new keyboards to match the type of data you want to collect. New keyboard types include URL, number, email, phone, and more. Automatically scan bar codes using your iPad and iPhone with FileMaker Go – no plug-ins required. Scanned data can also be accessed from your desktop. The new FileMaker 13 Platform helps you create custom business solutions that are not only professionally designed but gorgeous too! When a database looks great, it’s more compelling to use. Your team can easily manage and share data, making them more productive than ever. Modify and save changes to existing layout themes to match your exact business needs. Reuse your themes across other solutions, and share with your colleagues. FileMaker Pro 13 comes with 11 new, ready-to-use themes - for a total of 51 themes - to help you easily design custom solutions for iPad, iPhone and desktop. Themes now have styles (sets of colors, fonts and text sizes applied to objects such as buttons, fields, and backgrounds) to give your solutions a consistent and professional look. Choose from a variety of predefined styles or customize and save your own. Modify a style once and it changes everywhere. 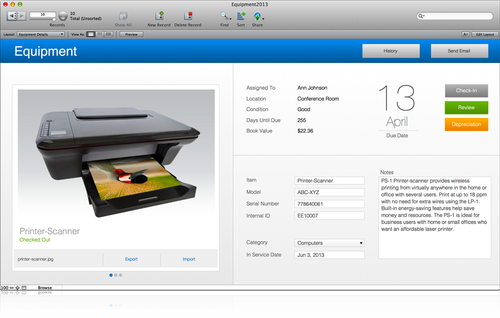 The Contacts, Assets, Content Management and Invoices Starter Solutions have been entirely re-designed with a fresh look that takes advantage of new features in the FileMaker 13 Platform. Drag and drop fields directly onto your layout with the new Field Picker. Includes convenient options for controlling field and label placement. Make your layouts more interactive by hiding or displaying objects such as fields and buttons based on a specific condition or calculation. Secure your data wherever you keep it – desktop, device or server. Using powerful 256-bit AES encryption, your data is now secure from unauthorized access when it’s on a FileMaker client or hosted on FileMaker Server. FileMaker Pro 13 Advanced is required to enable encryption. Also new is a visual encryption state indicator that shows when a connection to the server is secure and whether or not it is validated by a third-party certificate. The FileMaker 13 Platform also includes new scripts, Script Triggers, calculation functions, container field enhancements and more. Check out over 50 exciting, new features. Learn why FileMaker software is the fast, cost-effective way to develop gorgeous custom business solutions for iPad, iPhone, Windows, Mac and the web. Discover tools and resources for creating FileMaker solutions on the FileMaker Pro 13 Resource Center. View solution videos and stories to learn how a wide range of industries and organizations are using FileMaker. Join FileMaker’s free TechNet developer program. 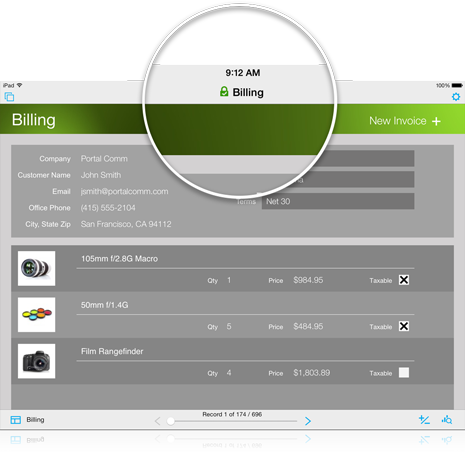 FileMaker Pro makes it easy to create custom solutions for managing business information on iPad, iPhone, Windows, Mac and the web. Millions of people around the world use FileMaker Pro to streamline the way their teams manage contacts, track inventory, organize projects and so much more. Connect to data hosted on FileMaker Server using any combination of FileMaker Pro, FileMaker Go and FileMaker WebDirect clients. Use concurrent connections to access solutions hosted on FileMaker Server 13 from FileMaker WebDirect or FileMaker Go. FileMaker Server includes one built-in concurrent connection. Additional connections are available for purchase.